In this episode, Emily interviews John Vsetecka, a second-year PhD student in History at Michigan State University. When John was a prospective PhD student, he attempted to negotiate the stipend and benefits of the three admissions offers he was seriously considering. John shares exactly how he initiated the negotiation process and the outcomes at each of the universities. His negotiation method is well-researched and well-considered and is applicable to many if not most other prospective graduate students. John and Emily also discuss how prospective PhD students should combat imposter syndrome during the admissions process. John Vsetecka is a second-year PhD student in the Department of History at Michigan State University. He studies modern Ukrainian history, with a focus on the 1932-1933 famine. Before beginning his PhD program, he worked as a GEAR UP advisor. This is a federal grant agency that works with low income students, called Gaining Early Awareness and Readiness for Undergraduate Programs. He worked in Colorado to help middle school and high school, low income students prepare for college. Before this job, he got a Master of Arts in History in 2014 at the University of Northern Colorado. 2:55 What PhD offers and interview requests did you receive from universities? 4:21 What did you think about the offers from these three universities? John wasn’t sure what a fair offer was for a PhD position in History. Generally, PhD students are shy about sharing their financial experiences. So he did research and his mentor from the University of Northern Colorado guided him in this process. He talked to other PhD students, who would say they had enough to live on or that they were struggling. He used the websites GradCafe and PhD Stipends. He got a sense of what people were being paid, including their health insurance and fees. From all of this information, he decided two offers were fair and worth considering. Emily shares an important piece of advice for prospective PhD students is to do your research. Anonymous databases, like PhD Stipends, provide more transparency around these offers. But you should talk to current graduate students, because it’s one thing to look at the numbers, and another thing to get a feel for how it is to live on that amount. 7:54 How did you initiate the negotiation process for your PhD stipend offers? John negotiated his stipend offers during his interviews. He went to visit two universities in person for interviews, and had a virtual interview a University 3. His first interview was at University 2. During the visit, they have an itinerary and fully scheduled day. The experience is like a whirlwind. He prepared a set of questions for faculty members and set of questions for Graduate Director. With the Graduate Director, he talked about the PhD program as a whole to get their insight. Then he directly asked the Graduate Director if there is any other money available, such as other fellowships, and explained that he has other offers with higher financial value. The Graduate Director is the one that can control the money. The faculty can only put in good word on a student’s behalf. So as a prospective PhD student, you should know who you can talk to and know who you can negotiate with. You don’t need to be afraid to ask tough questions about financial aid. The PhD program interview was a good time to negotiate PhD stipend offers. John waited until he received all offers to see where he stood across the field, and this gave him some leverage. Negotiating like this is is what people do with any other job. John told the Graduate Director that he had other offers, but he didn’t show them the letters themselves. Negotiating before receiving all other offers and before the interview can seem desperate. But if he negotiated after the visit, it might seem like that offer wasn’t his first choice and he was only negotiating after losing another offer. John also believes that talking in person is the best type of communication. Negotiating in person puts them on the spot. During his interview visit for University 2, John asked the Graduate Director about the potential for a better financial package. The Graduate Director told John that they would get back to him a couple hours. Later that day, John received an email with a offer for a fellowship package. This showed John that they were willing to work on his behalf. He was surprised by this because he had expected them to negotiate and push back. During the interview visit, the department is most focused on recruitment, so they quickly considered his request and acted on it. John went into the meeting with a set plan for negotiation. He had a notebook and visibly took notes during the conversation, which indicates that he took the negotiation seriously. Treating graduate school interviews like a professional scenario sets you up for success. 14:35 What new offer did you receive after negotiating? Because he negotiated with the Graduate Director, John received an offer of a university fellowship instead of a teaching assistantship. The new offer was university-based funding, not department-based funding like his original offer. The university fellowship had different teaching requirements than the department teaching assistantship. It was more money in total, as well as better health care coverage. This showed what kind of control the department and university has over financial awards for PhD students. Even if the university can’t raise stipends, they can cover more fees or provide better benefits. 16:22 What outcomes did you get from negotiating with the other two universities? John learned that not everyone would negotiate. At Michigan State, he had a generous offer that he was already happy with. Even so, he asked the Director of Graduate Studies at Michigan State about his financial award. The director kindly told him that his original financial award was what the department was willing to offer. John later learned that his department offers different financial packages based on a tiered system, and he was happy with the offer he received. At University 3, John had a virtual meeting with the department. John brought up that he had offers with much more value than what they had offered him. John says that honestly, he was displeased with University 3’s financial offer. He learned that due to financial constraints at University 3, the department couldn’t offer more money. The department suggested term-to-term options. John didn’t want to be on his toes every semester wondering if he’d get paid. Though University 3 offered paid tuition, the money offered for teaching/research was not enough to even consider. It’s important for prospective PhD students to recognize that some offers only tell you about the first year, while others present a five-year plan for funding. 19:35 Based on what you experienced, what would you do to negotiate differently? John says he wouldn’t change much. While he knew negotiation was possible, he personally didn’t know anyone in his cohort group that negotiated their stipend offer. John heard from his advisors and mentors that it’s ok to ask, but you have to know to ask. John says this is one of those hidden things in academia. If prospective graduate students receive multiple offers, this is a chance to use offers against each other. Emily brings up that often, applicants don’t feel a lot of confidence. They often think, “Who am I to be receiving these offers?” This imposter syndrome deters prospective PhD students from negotiating their stipends and ensuring that they receive the best offer. 22:27 How did you know negotiating your PhD offer would be possible and welcome? 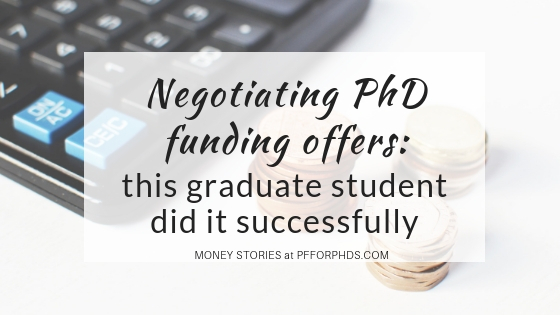 John’s MA program advisor told him how to negotiate PhD stipend offers. First, you have to apply to multiple universities and know their programs well. Second, you need to know who you want to work with. Third, you need to talk with current graduate students. This is the most important advice. If you find their email on department websites, you can email them directly. Fourth, online communities like GradCafe help you connect with people who can help you. John says that graduate school applicants should treat a PhD position like any other job. John says this profession should not be excluded from the process of negotiation. John’s experience at GEAR UP, where he helped low income students fight for undergraduate school money, showed him that there is a lot of money out there. He says it’s unfortunate so many undergraduates go into a lot of debt, when there are all types of money out there for different skills and talents. John wonders why graduate students can’t have that money too? There are different organizations, based in different fields, but money is out there. He suggests prospective students apply to everything they’re qualified for, but they also ask universities and departments what they can give. Emily adds that prospective PhD students need to consider cost of living. If you have school A versus school B with higher stipend and in lower cost of living, you can ask the school A’s department what they can do to make the offer comparable. 26:44 Has your negotiation had any lasting impact on your graduate career? John says the negotiation process doesn’t stop when you receive your final offer. Negotiation is a longer standing issue to think about in the future. At Michigan State, John and his peers negotiate for conference money, travel money, research money for the summer. Some graduate students can’t find money beyond teaching assistantships. Because he considered these benefits in his financial offer, he accepted a position that allows him the time and money to not worry. He has summer funding and he can teach online. For instance, he taught a seven week class online while being in Ukraine for research. He chose a school with an institutional investment. The department is doing well and it is investing in its students. He saw that the department was willing to invest continually in their students. He thinks the investment will continue after he graduates. John says prospective graduate students should feel free to reach out to him. He likes to help in any way he can. When you get your offers, the first thing you should do is celebrate, and get a round of applause. After celebrating, look over your financial offer, and look beyond stipend to health insurance and benefits. If you get multiple offers, compare them. Be confident about your acceptance into a program and don’t be afraid to negotiate. Know that you have power in these situations. Even though graduate students often don’t have much power, this is the situation where you do. You have all the power and you should use it while you can. John treated PhD offers like job offers because it’s also a job, in literal and figurative sense.